Cartridge gun dispensers are designed for the controlled application of pastes, gels, adhesives and fluids. High quality cartridge gun dispensing systems. Our guns are covered by a one year warranty and supplied with a basic starter component kit. This version gun is for all 12oz size industry cartridge tubes. 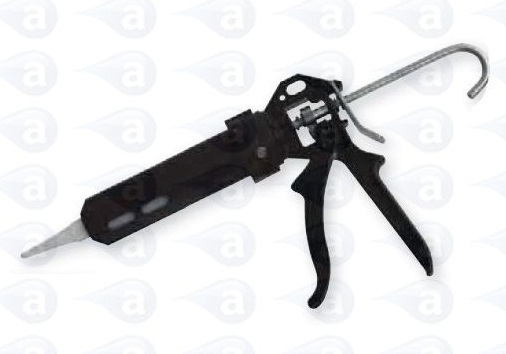 A high quality manual cartridge gun with quick attach bayonet head and slight reverse rod action to reduce oozing. 12oz size (355cc approx). Suited to controlled lines or potting of most adhesives, fluids, sealants, RTV, grease, gels, long cure or single part epoxies, mastics and potting compounds. Undo the metal retainer body from the handle on the gun (bayonet fitting). Load in a plastic dispensing cartridge. Ensure the manual metal rod is pulled fully back by twisting the push rod end facing downwards and pulling it back. Replace the metal retainer. Attach a threaded nozzle or use a male luer lock adapter for attachment of any standard needle tips. Squeeze trigger for flow. Release of trigger stops material oozing.